The Manhattan Project is largely remembered through the lens of colorful male American figures: Richard Feynman, who in Surely You’re Joking, Mr. Feynman! describes cheerfully playing the bongos after the test of the first bomb, and J. Robert Oppenheimer, who at that moment famously quoted from the Bhagavad Gita: “I am become Death, the destroyer of worlds.” A more modest figure is easily overlooked amid this overwhelming, and slightly inappropriate, drama in the face of massacre. However, the “Manhattan Engineering District Project,” as it was officially called, involved over 130,000 people working in three different Allied countries: the US, the UK, and Canada. Collaborating scientists were sourced from far beyond these countries, including exiled European scientists, like Hungarian-born physicists Léo Szilárd and Eugene Wigner. While the figures of Feynman, Oppenheimer, and others loom large in our history of the Manhattan Project, much less known is to what extent non-Western and woman scientists contributed to the development of the bombs, let alone non-Western women. One of the most fascinating of these scientists is Chien-Shiung Wu. Born in Liuhe, China, in 1912, Wu would become an eminent experimental physicist, confirming a physics phenomenon called parity violation. 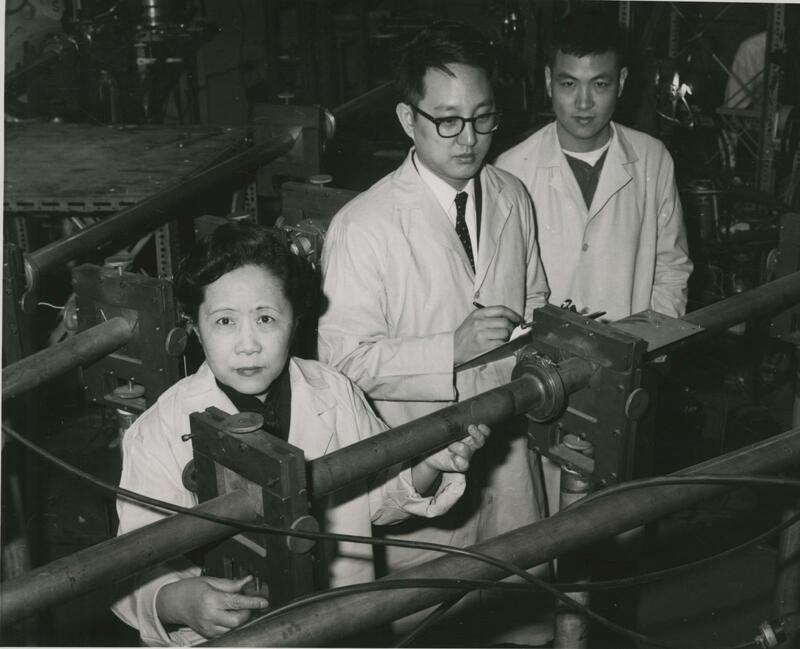 With this discovery, Wu became one of the many women who performed the essential research that led to other men, in this case Tsung-Dao Lee and Chen-Ning Yang, being awarded the Nobel Prize in Physics in 1957. But before Wu went down this impressive career track, she spent the final year of the Second World War working on the Manhattan Project, making essential contributions to the successful development of the bombs Little Boy and Fat Man. In the early 20th century, it was not unusual for Chinese scientists to spend part of their careers in the US. There were many promising Chinese academics then, few of whom are remembered in the English-speaking world: mathematicians Shiing-Shen Chern, renowned for his work in geometry, and Luogeng Hua, who studied at Princeton before returning to China and becoming a science education reformer for the communist government. These men, contemporaries of Wu, are both virtually unknown in the US presently. The state of world politics at the time made scientific collaborations between China and the US strategically advantageous. The Second Sino-Japanese War had broken out in 1937, and was initially waged as a separate war. When Japan attacked Pearl Harbor in 1941, this war became part of the Second World War, and the US and Soviet Union came to China’s aid. Both wars were ended with Japan’s surrender in 1945 after the atomic bombs had been dropped. Famines during the war cost the lives of tens of millions of Chinese civilians. The bombs came as a relief for China; they immediately ended the war, preventing an even bigger humanitarian tragedy. At the height of the Sino-Japanese war, Wu was working abroad as an early career physicist at Berkeley, and had just married a Chinese man, Luke Yuan, who was in the same situation. The war had closed off the Pacific, and they could no longer go back to, or even correspond with, their families back home. Wu faced strong sexism and even gender segregation in US academia. Initially, she planned to spend only one year in California as she had been offered a PhD position at the University of Michigan. However, after hearing that women there weren’t allowed to use the front door of the newly built student centre—they had to take a side entrance instead—she quickly decided to stay at Berkeley. Wu didn’t immediately join the Manhattan Project upon its commencement in June 1942. When enrolled in Berkeley as a graduate student after arriving in the US in 1936, she studied under renowned Manhattan Project physicists like Oppenheimer and Ernest Lawrence, who supervised her doctoral work. Oppenheimer regarded Wu’s work very highly, and would later publicly state that Wu should have shared the 1957 Nobel Prize. In 1944, he supported her transfer to Columbia University in New York, where she became affiliated with the project under the Division of War Research. Wu was never at the more famous sites in New Mexico, Los Alamos and White Sands, where the bombs were built and tested. She did, however, receive the high security clearing associated with the project, which was unusual for non-European migrants. Wu was known for her extreme precision. During her PhD while working closely with the later Nobel Prize winner Emilio Segrè, she investigated the role of xenon gas in uranium fission. Because of this work, Enrico Fermi asked her to help solve a central problem on the Manhattan Project: how to extract uranium-235, which can undergo fission, from the more stable uranium-238, and how to subsequently concentrate the 235 into a critical mass. The chain reactions in the laboratory kept failing, and the culprit turned out to be xenon gas. Wu was contacted as the expert in this particular area, and she supplied the results of the research she had refrained from publishing because of their sensitive nature in the war. She ended up publishing this paper in 1945 after the war had ended. In Their Day in the Sun: Women of the Manhattan Project, Ruth Howes and Caroline Herzenberg write that when the news about the Manhattan Project became widely known, only one woman’s name rose to prominence: Lise Meitner. She discovered nuclear fission in collaboration with Otto Hahn, who (this story is getting old) was awarded the Nobel Prize in Chemistry in 1944 by himself. Despite never working on the actual development of the bombs, Meitner is more closely associated with the Manhattan Project and its history than Wu, who did contribute directly to the bombs’ development. One reason for Wu’s lack of fame in the English-speaking world can be attributed to the political situation after the Second World War and the rapidly disintegrating relationship between the US and China. The Western perception of China rapidly took a negative turn after the founding of the People’s Republic of China in 1949. China isolated itself from non-communist countries by what was popularly known as the Bamboo Curtain, in which there was no movement in or out China without permission from the government. Shortly after the start of the Chinese Cultural Revolution, the Korean War broke out in 1950 with China and the Soviet Union on North Korea’s side, while South Korea was backed by the US and their allies. Anti-Chinese sentiment combined with anti-communist attitudes constructed an East-West dichotomy, with Western priorities at the center of the histories we tell about the Manhattan Project and the years that followed. Wu’s insistence that as a woman scientist she had been treated much better in China than in the US fits uneasily into this political climate. Her reputation is likely to have been negatively affected by the political relations between the US and her now communist native country, even though she openly opposed the People’s Republic of China. She instead made repeated visits to the Republic of China, Taiwan, led by exiled former Chinese president Chiang Kai-Shek. In the 1950s, Chinese scientists in the US were under intense scrutiny during what is known as the Second Red Scare. Most notoriously, MIT rocket scientist Xuesen Qian was accused of Communist sympathies, detained for five years, and finally sent to China, where he made vital contributions to the Chinese space program. Wu herself, a naturalized US citizen by this time, did not experience such direct scrutiny, but was unable to return to mainland China for the funerals of her parents and elder brother because the US forbade its citizens to travel there. She was finally able to return in 1973, by which time the tombs of her parents had been destroyed in the Cultural Revolution. The role of the atomic bomb and improved versions of nuclear weaponry formed the foundation for the Cold War. China, too, played its part, testing its first nuclear weapons in 1964. Several of the scientists who helped develop the Chinese nuclear program were taught by familiar faces: Sanqiang Qian studied under Irène Curie, and Ganchang Wang was a student of Lise Meitner. Wu, meanwhile, played her part in Chinese nuclear policy. When visiting Taiwan in 1965 to receive an award, she advised Chiang Kai-Shek not to construct an atomic bomb there because, according to a 1990 interview with Wu, such developments would be too expensive. The popular historical narrative of the Manhattan Project presents it as a masculine, western enterprise, fitting the image of the young, white, male soldier on the battlegrounds of the two world wars. Yet the work of Wu, among many others, shows that the narrative was more complicated than that. Women, non-white, and non-Western people made vital contributions to the Manhattan Project and the physics underlying it. They disappeared from the history of the project as it was used to reinforce the image of the US as the leading Western superpower, both politically and scientifically. The forgotten history of Wu is one where state politics meets gender politics to the detriment of our understanding of scientific development. Chiang, Tsai-Chien. Madame Wu Chien-Shiung: The First Lady of Physics Research, World Scientific Publishing, 2014. Cooperman, Stephanie H. Chien-Shiung Wu: Pioneering Physicist and Atomic Researcher. Rosen Publishing Group, 2003. Howes, Ruth, and Caroline L. Herzenberg. Their day in the sun: women of the Manhattan Project. Philadelphia, PA : Temple University Press, 1999. Dr. Kanta Dihal is the Postdoctoral Research Associate and Research Project Coordinator of the Leverhulme Centre for the Future of Intelligence at the University of Cambridge. In her research, she explores the public understanding of artificial intelligence as constructed by fictional and nonfictional narratives. Her work intersects the fields of science communication, literature and science, and science fiction. Having completed two undergraduate degrees and a research master’s at Leiden University, she recently completed her DPhil at the University of Oxford. In her thesis, titled ‘The Stories of Quantum Physics,’ she investigated the communication of quantum physics to adults, children, and even babies.